Watch Kochi International Half Marathon 2013 live streaming on the website of Asianet News and various other malayalam news channels. With huge prize money for the winners, this would be first to be held in the town featuring athletes of national and international reputation besides well-known personalities representing the political, cultural and artistic world. With around 10,000 participants expected to be a part of the mega event, the Kochi International Half Marathon would add more. It would be a great moment for residents of Kochi to witness one of the great events to be held in the city. After Delhi, Mumbai, Chennai and Bangalore, 'Kochi' the satellite city of Kerala is gearing up to host the first edition of Kochi (Cochin) International Half Marathon to be held on 29th December 2013. With a total prize money of Rs 25 lakh, this grandiose event is organized by Kochi corporation in association with Push Integrated Communication Private Ltd. The event has been organised in three categories – 21 km half-marathon, 2 km celebrity run, and 7 km amateur run. The marathon will be flagged off from Maharaja's College ground at 6.15 a.m and would conclude in three hours. The participants would make their run to Fort Kochi Veli ground, and later will run back to the College ground. During the run, the contestants will touch the major landmarks in Cochin and many places of historical interest. Meanwhile the amateur run will start at 6.45 a.m. on the synthetic track of the ground. 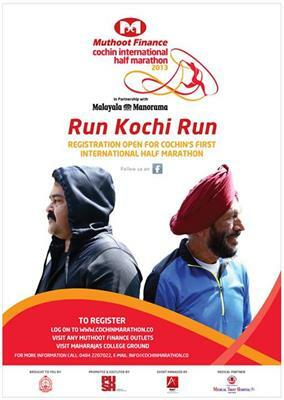 With athlete Milkha Singh and actor Mohanlal being the brand ambassadors, this Cochin International Half Marathon will be an exciting event to watch. Some of the international athletes including Emmanuel Mutai, Helah Kiprop, Bernard Kipyego, Michael Kipyego, Merkebu Birke Ayele, Abere Belay, Sammy Korir and Melaku Bizunesh would run the Half Marathon. Preeja Sreedharan will be the Indian representative to watch. A two kilometer celebrity run which feature icons including Mohanlal and Manju Warrier would be something much special to cheer. The winners will carry home USD 5000 while the runnersup will get USD 3000. Indian athletes both men and women who finish winners and runners up will get Rs 3 lakh and Rs 1.5 lakh respectively. The mega event which kicks start at 6.15 AM will be telecast live by various malayalam channels. The Kochi International Half Marathon 2013 can also be watched live online through the website of Asianet News and other malayalam news channels.